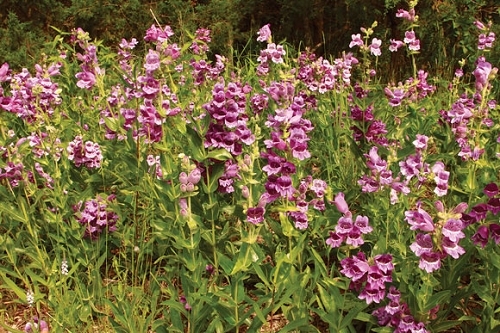 This is one of Missouri's most spectacular plants with many violet to rose-purple, snapdragon-like flowers atop 16-24 inch stems. In cultivation, 16 to 20 flowering stems per plant are possible. The flower color can vary from nearly white to deep purple. Missouri Primrose is the perfect companion plant for purple beardtongue; the combination of yellow and purple is very showy. They are both at the peak of their blooming periods at the same time: late May and June. Purple beardtongue is native to southwest Missouri's limestone glades. Glades are hot, dry, and sunny--the midwest version of a desert. This means that you don't need to amend your poor soil with organic material or manure. If anything, this species might benefit from a little lime.